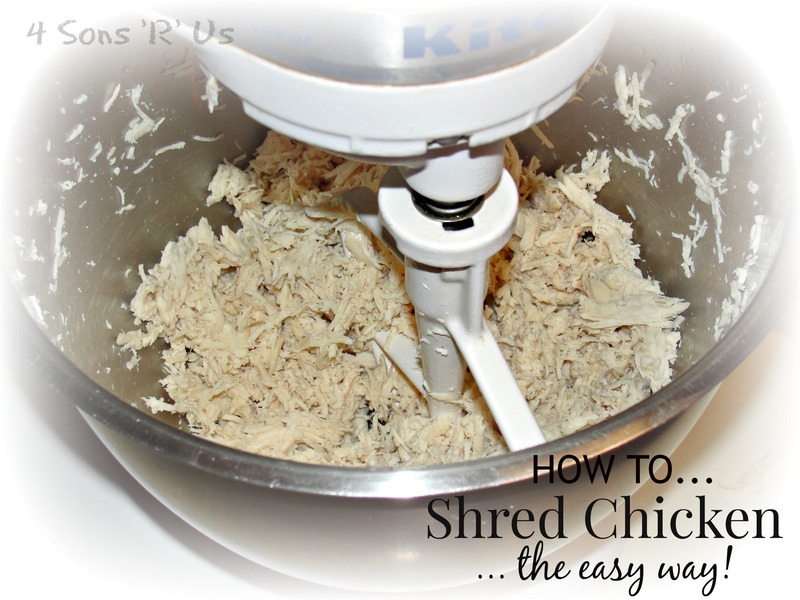 How To Shred Chicken…The Easy Way! I can’t wait to tell you about this awesome trick I recently discovered! This is the absolute, without a doubt, easiest way to shred chicken and have it be consistent. An added bonus? You keep your hands clean and cramp free! I use shredded chicken in my recipes. A lot. I used to have to use 2 forks, one to hold the breast while the other one pulled. This takes a long time, especially if you’re doing more than one breast. I used to positively dread the task, and would put it off until the last minute. Now I can shred up to 3 chicken breasts in under 1 minute! Maybe I’ll time myself next time. I bet I can even do it in under 30 seconds! 1. Cook your chicken breats however you normally would whether it be poached, oven roasted, or even in the crockpot. When the chicken is fully cooked, place up to 3 breasts in the bowl of your stand mixer. Don’t attempt to do more than 3 at a time. Trust me on this one, I had to learn it the hard way. Chicken chunks flew everywhere. It wasn’t pretty. 2. Start off slow and increase the speed, as needed, to shred your chicken more. In a snap you will have this! Perfectly shredded chicken with no mess, and no hand cramps. I couldn’t believe how simple this was. I will never EVER shred chicken with 2 forks again! Take a look at how fine the shred is, it would take forever to get that with 2 forks! 3. Proceed with your recipe of choice and use your shredded chicken however the meal requires. Boss status…achieved! You’ve owned that chicken & your kitchen. I love the sons to death, but sometimes I wish they’d stop badgering me about what’s for dinner. They’re like a whole revolving chorus of broken records with the question. It’s like some insane versions of food-related whac-a-mole. Get one to stop, another one pops pipes up. It makes me want to scream, and tear out tufts of hair. Sons, I’ll let you in on a little clue…if I’m not even done clearing/cleaning the breakfast dishes, I am not ready, in any way shape or form, to address the dinner issue. Sometimes when you ask me what’s for dinner…..I honestly don’t know yet! It’s not like I have an inexhaustible source from which I can pull creative meal plans to begin with, and I’m horrible under pressure. As you may have noticed. Repeatedly. To be clear, I am not, nor will I ever be, a short order cook. Some days I can barely get it together to prepare ONE meal for us all. There’s a lot of pressure to make something healthy and enjoyable for everyone…and some nights that even proves impossible. Let’s be honest, NO matter what I finally do tell you is for dinner, at least one of you will be unhappy. At least one of you, somedays more, either before sitting at the table, or in between giant mouthfuls you can barely chew, will make sure to ‘express yourself’ and rebelliously declare that you don’t, or you may have, liked it if I’d only done A or B differently. Can I just put it out there again, how much I loathed being asked the revolving question (6925x) of what’s for dinner? Even when I’d refuse to answer, the sons would continue. And then I had an epiphany. The menu board! Not only would it better help me plan my weekly menu in advance (at least for the chaotic dinner rush), but the sons could finally have answers without ever having to ask! It was a Monday morning miracle!! Hallelujah! There’s was no light bulb, but there was a heavenly chorus and golden beams of light shining down all around (well, at least in my head). The sons, knowing me, know that you get what you get and you don’t pitch a fit, or you may lose your plate. This little God-send has helped save my sanity and has actually helped curb complaints. It’s in writing. On the board. It might as well be set. in. stone. I no longer have to get cranky and frankly driven a little past crazy when they ask what’s for dinner for the eleventh time on any given day. I know my obligation to make dinner. And I do truly want to nourish them. Most nights I even enjoy it. The menu board is a promise. If somethings marked in for the day we can all just assume that at some point it will be dinner time, and at that point the sons can rest assured, I will put some form of decent –albeit occassionally uninspired– nutrients on the table for your consumption. The world has become such a more peaceful place for the six of us. Well, seven, if you include the dog (who has, ahem, yet to ever complain about anything I’ve fed him…..just sayin’). So simple, but cute and life-saving fully functional. Don’t have dinnertime issues? 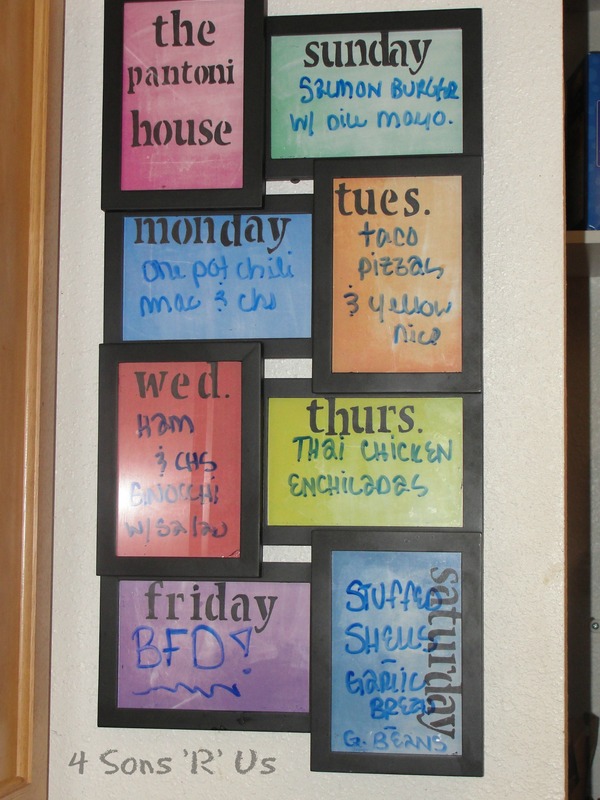 Use it as a weekly memo board so the kids (and Mom) know what the big plans are for the day. 8 frame picture frame (I purchased mine from Walmart for around $10) and you can choose from woodgrain or black frame. 1. Using the paper inserts (ya know the ones with random people smiling at you!) as templates for your scrapbook paper and cut out 8 rectangles. 2. 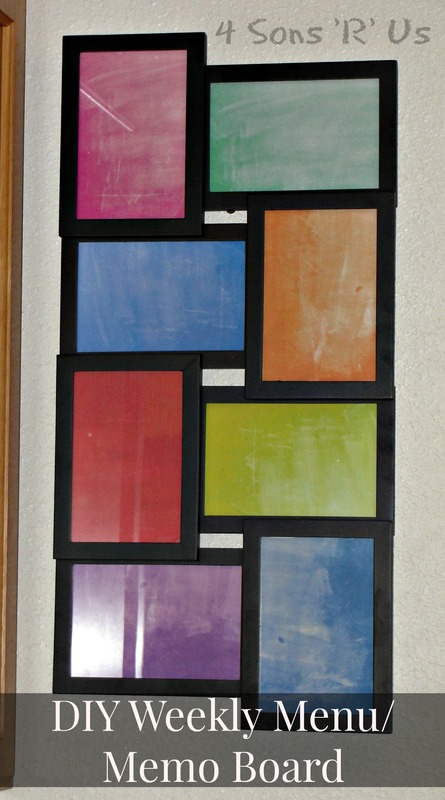 Lay out your pieces of paper in the direction and order you’d like them to hang in the frame. 3. Keeping in mind which directions your board will hang, vertical or horizontal, decorate each piece to coordinate with a different day of the week. 4. Feel free to ‘bling em out’ a little but, just be careful not to over clutter as it will make it hard to write over. 5. When you’re done decorating, reassemble, and enjoy your new menu board or weekly planner. At first I was skeptical of ‘roasted’ bacon. Give up cooking those amazing strips of crisped perfection in my trusty skillet? I couldn’t imagine an oven version being able to compare. But I was game to at least give it a try. After all, I am always the one encouraging the sons to at least try things before sticking their noses up in the air, or saying ‘ I can’t’. Gotta practice what I preach! After that first batch I was quickly converted. Love bacon? Hate the mess? This is the easiest way to prepare and enjoy that unhealthy, yet damn delicious, treat. 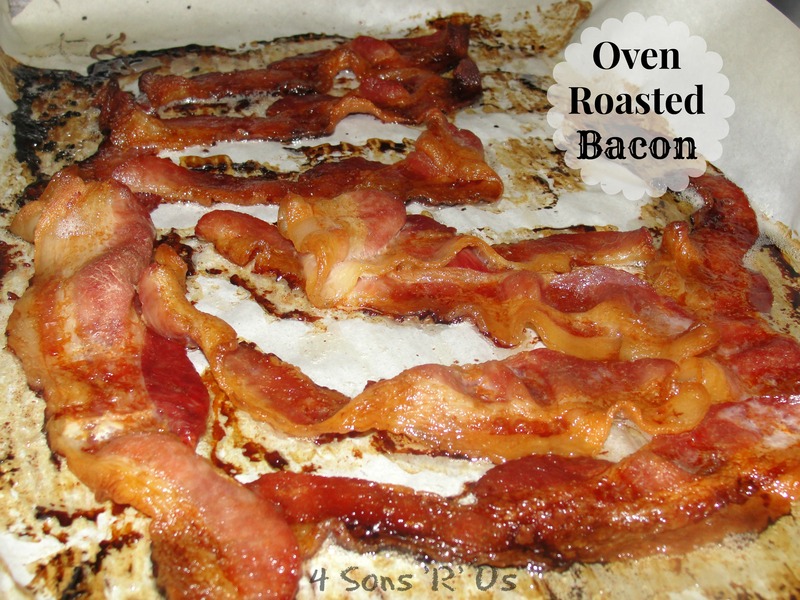 Even better than less mess, bacon cooked in the oven cooks more evenly, and requires a whole lot less work from you! Throw it in the oven, set a timer, forget about it and go about your business ’til the buzzer. Oh. Em. Gee! How can you stop at just one strip?! 2. Place a sheet of parchment paper on a sheet pan. 3. 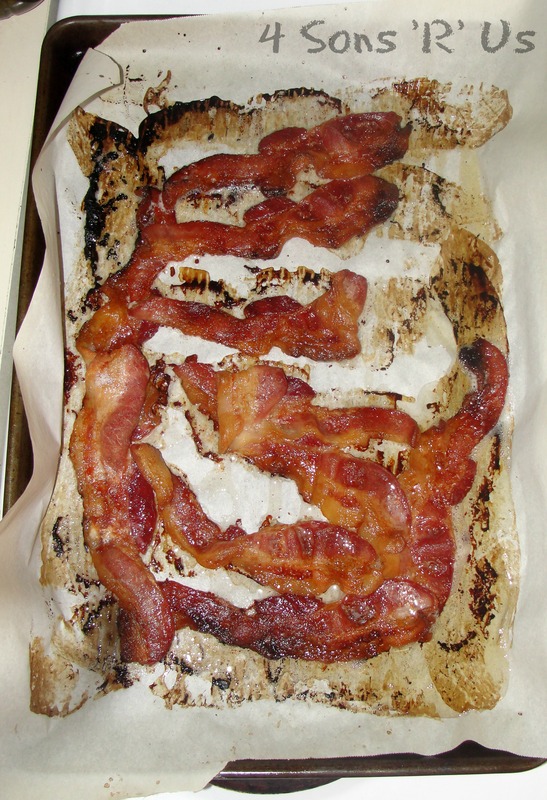 Lay the bacon on top of the parchment paper, as best you can without the strips touching each other. The less overlap, the more crisp & crunch. 4. Bake for 15 to 20 minutes, or until the bacon is really crispy. 5. Use a pair of tongs to remove the bacon from the tray and drain on paper towels immediately (so it stays crispy!) and serve.